Join us as we celebrate the groundbreaking for South Dakota State University's new Raven Precision Agriculture Center! The ceremony will take place on Saturday, Oct. 6, 2018, from 1:30 – 3:30 p.m. The Raven Precision Agriculture Center, to be located on the university’s main campus in Brookings, will lead the nation in precision agriculture education, research, and extension. Raven Industries gave $5 million to the project in January. The facility will bring agronomy, engineering, and computer science disciplines under one roof, where students and faculty can collaborate, conduct research and innovate. Students who are trained in this new facility will provide a workforce that will be uniquely qualified and ready to provide value within the agriculture industry. Casual game day attire is welcome, as the Precision Ag Bowl Game vs. Indiana State is to follow. Tickets for the game can be purchased through the Jackrabbit Ticket Office by calling (605) 688-5422. The groundbreaking ceremony will take place just south of the Animal Science Complex on the corner of Medary Avenue and North Campus Drive. 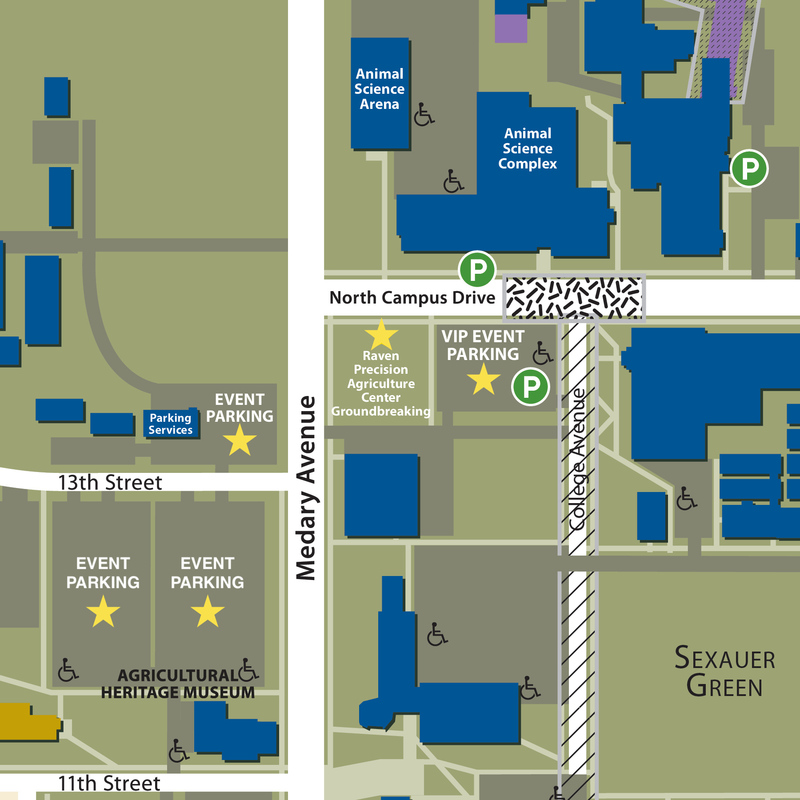 Parking will be available at the lots with yellow stars on the map, pictured at right.